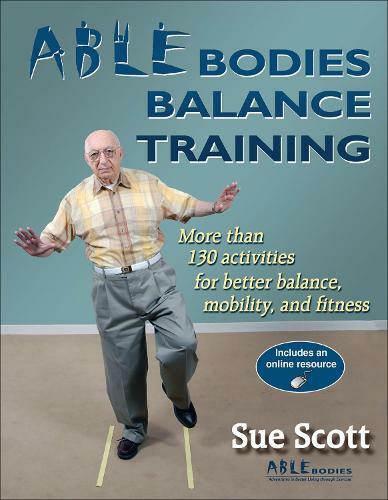 This new book includes more than 140 activities and exercises designed to progress and improve many facets of balance and mobility for more frail older adults. This instructor's guide uses strength training alongside other components known to impact balance. Purposeful activities have been designed to enhance and integrate aspects of flexibility, posture, core stability, kinesis, rhythm and gait.The book promotes a 'Can Do' attitude that improves communication and progress. It is the integration and progression of all of these components that make the ABLE Bodies Balance Training unique and engaging.In addition, "ABLE Bodies Balance Mobility" offers flexible programming and a way to re-tool programs to be more balance specific.Instructors can either choose to follow the 16 session plans that safely progress older adults, or they can choose from any of the five component categories of exercises and activities selected specifically to enhance balance and mobility per each of the following component categories: flexibility, posture and core stability, strength with a purpose, balance and mobility and cardiovascular endurance.